David Lereah will more than likely not look back on 2009 as one of his better years. It can all be traced back to a book he authored and released in February 2006. 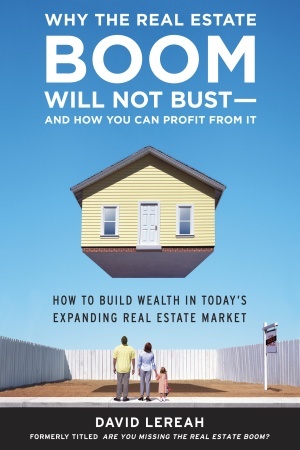 The book – “Why the Real Estate Boom will NOT Bust and how you can Profit from it”, obviously churns the stomach of anyone who simply reads the cover. It would surely also make life pretty much imposible to David to ever have an ounce of respect in the marketplace. Making it all worse is the fact that David Lereah was the National Association of Realtors’ Chief Economist and a major spokesman for association. Just about everyone has tried to distance themselves from David, even the National Association of Realtors and rightly so. It is easy to look back on all of this and lay blame, but associations and institutes seems to be rolling out figures that eventually make them and their agents look foolish. Associations and Institutes have got to understand that it does not help agents causes that real estate institutes or bodies representing them make claims that are clearly only in line with helping to further the cause of agents. As always in the long term – it always pays to provide full frank advice, or perhaps shut the hell up! Hopefully Australian Real Estate Institutes will just stick with wanting a steady market and not try too hard to talk the market up. Real estate advertising gone wrong! “…it does not help agents causes that real estate institutes or bodies representing them make claims that are clearly only in line with helping the causes of agents. It goes on all the time, especially with REI CEO’s providing critique and analysis on ‘the market’ when they aren’t expert in such areas by any means. All this does is decrease the value of the Institutes and thus their member agents, in the eyes of the public.